Everything your business needs is everything you have always been! If you are ready to create a life and business that looks like no one else then it is time to see all of your gifts with fresh eyes. This past March we held our first live business workshop here at our studio and it was more than I could have EVER imagined. The women, the businesses, the dreams, the struggles, the connections and how they left ON FIRE! I have watched them each show up in their businesses in powerful ways since the workshop and we are ready to open registration for our next one. Will you join us? I know how hard business owners work so this time we wanted to mix a little work with play. If you are looking for direction with your next idea, a kick in the pants to start or to have fresh inspiration breathed into your current business I hope you will join me for a workshop that is all about connecting with your gifts, building your brand, launching it out into the world and nurturing what you have created. 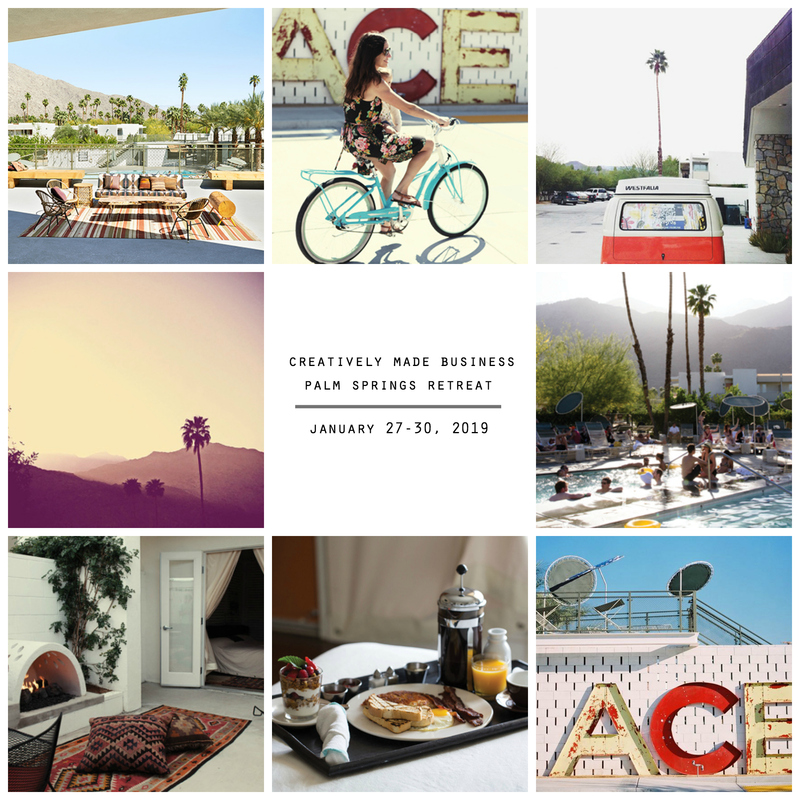 Let’s talk business this January 2019 in Palm Springs at the Ace Hotel & Swim Club! 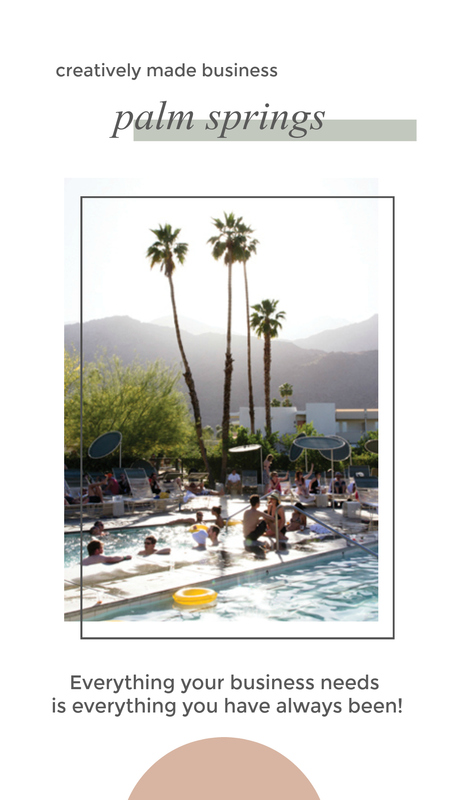 We will meet each day in the beautiful light-filled clubhouse that overlooks the pool. 2:00-4:00 Your individual small group will meet to brainstorm, connect and strategize. 4:00-5:00 Your individual small group will meet to brainstorm, connect and strategize. -How do you want your life to look and feel? -What can you offer the world for free? -Do you want to grow deep or wide? We have built our creative business over the past 11 years. We started with a small Etsy shop, manufactured our own soft goods for many years, created and manage an online creative network with art + lifestyle workshops with over 36,000 members, sell original art + prints, a keynote speaker at large business and women’s workshops around the US, teach live art workshops in the US and abroad, collaborate with artists from all over the world and my first book, The Painted Art Journal, through North Light books has just launched into the world. It has been a crazy, hard and beautiful journey so far. As a business consultant the past four years I have been able to help other creatives get their ideas off the ground, fine-tune an existing business or coach how to take their business to the next level. With our whole heart, we believe it is time to expand this part of our business to work beside more creatives as they build their own Creatively Made Business! Thank you for the honor of standing beside you as you nurture your creative life! 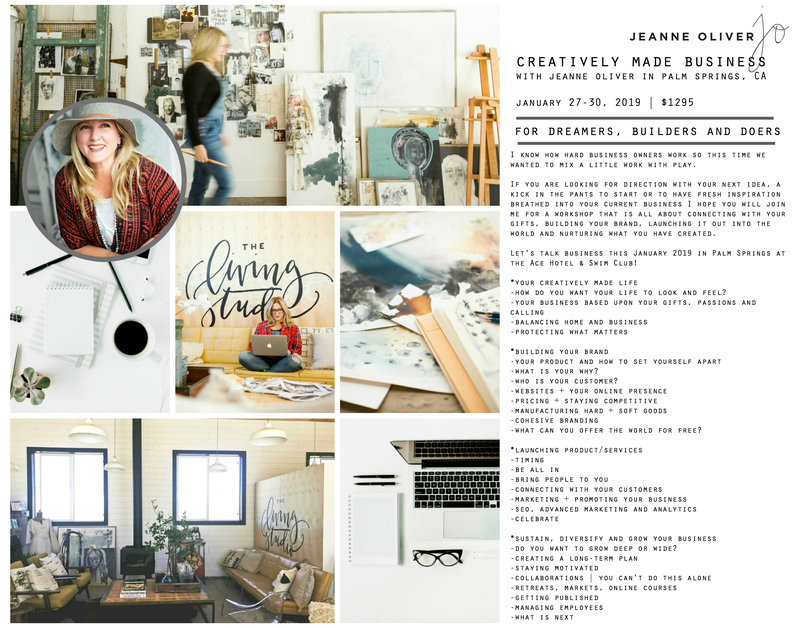 If you have any questions please email me at contact@jeanneoliverdesigns.com. Payment plans are also available at checkout.